There's nothing more nerve-wracking than hearing the propane tank you just exchanged down at the gas station rolling and slamming around in the back of your car. 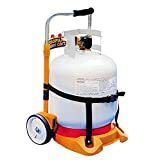 The solution is this cool new No-Tip Propane Tank Caddy / Carrier. This unique sling not only helps you carry an up to 20 lb propane tank with ease using it's built-in handles, it also has a removable weighted stabilizer base that helps prevent a propane tank from tipping over during transport. A little peace-of-mind is always nice when you're traveling with an explosive compressed gas container.